The next session is on Saturday 5th May (10am-12noon). Anyone is welcome to join Jane and Jan and to do their own art or craft work of the church or grounds. Please bring your own materials and be prepared to clear up at the end of each session. 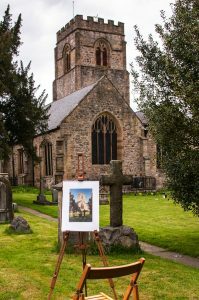 At the end of the year an exhibition of works produced of the church and grounds will be held in the hall with proceeds of sales going to St Mary’s, Chirk.